BEIRUT: “Please do not touch” will become “please touch” in Lebanese museums for the country’s blind and visually impaired consumers of tourism and culture. The “Doors: Please Touch” initiative, launched by Lebanese NGO Red Oak in collaboration with the Omero Tactile Museum of Ancona, Italy, will introduce tactile exploration to Lebanese museums. Museums worldwide traditionally prohibit the touching of art and artifacts, a rule that has long denied visually impaired people the experience of exploring cultural heritage. The Omero Tactile Museum of Ancona is devoted to righting this discrepancy, through promoting a multi-sensory approach to cultural heritage and making exhibitions accessible to people with special needs. The museum holds a vast collection of artwork ranging from classical Greece, contemporary art, architectural models and archaeological findings, which can all be explored by touch. Exhibitions also offer descriptions in Braille and movable ladders for large artifacts. “We strive to make cultural heritage available to all people without barriers,” Andrea Socrati, Omero’s director of special projects, told The Daily Star. Red Oak, an organization dedicated to the promotion of innovative approaches to social, educational and cultural institutions, worked with Omero to implement the initiative in Lebanon, which will become one of the few countries in the world to support tactile exploration of art in museums. “We are committed to open the doors of art to all, [and to] provide equal access of cultural heritage,” Nadine Abou Zaki, founder of Red Oak, said at a news conference Tuesday at the Culture Ministry on the project. Abou Zaki developed the “Doors: Please Touch” concept through her interactions with blind children in schools. “Art is not only about sight. Touching art can trigger deeper emotions,” she said. Abou Zaki previously organized an interactive sculpture performance in 2014, titled “Please Touch,” which invited visitors to break the “don’t touch” rule and feel their way through the sculptures in a darkened room. The initiative is supported by the Culture Ministry and caretaker Culture Minister Ghattas Khoury, represented in the news conference by the National Museum of Beirut’s director, Anne-Marie Afeiche. “Doors: Please Touch” will be implemented first in the National Museum of Beirut, the Sursock Museum and the Modern and Contemporary Art Museum; followed by other national museums in Baalbeck, Jbeil, Tripoli and Beiteddine, in the hopes of eventually expanding to all the museums in Lebanon. The museums will first choose a tangible collection to make it available through “Doors: Please Touch.” A training program, managed by Omero, will initiate in October for the museum guides. Touch tours, audio-descriptions and multi-sensory museum paths that are accessible to blind people will later be added. The project also aims to raise awareness on the importance of artistic education and cultural communication, Socrati said at Tuesday’s news conference. 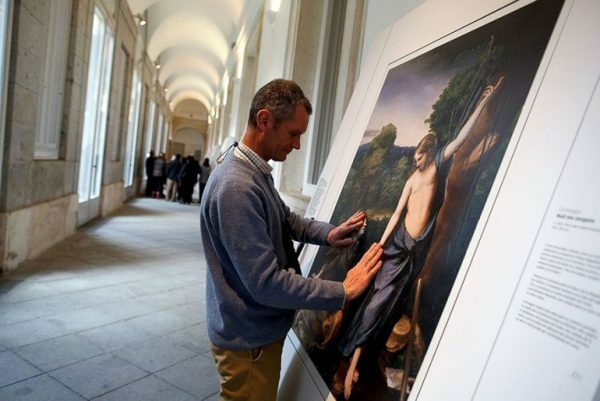 The three museums will open the specialized exhibitions to the visually impaired starting January. Tactile exploration, Braille descriptions and guided tours will be available every Monday at the Beirut National Museum, Afeiche told The Daily Star. Other museums will later announce their special tours dates. Nawaf Kabbara, president of the National Association for the Rights of Disabled People in Lebanon, said the project was a good start for realizing the rights of people with special needs. “This is a valuable initiative. However, what we really need is a comprehensive policy, for the rights of people with special needs, to be applied across all ministries,” he told The Daily Star.